The Large Hadron Collider (LHC) is the most recent accelerator constructed on the CERN site. The LHC machine accelerates and collides proton beams but also heavier ions up to lead. It is installed in a 27 km circumference tunnel, about 100 m underground. The LHC design is based on superconducting twin-aperture cryo-magnets which operate in a superfluid helium bath at 1.9 K.
CERN has recently built the Large Hadron Collider (LHC), a superconducting circular particle accelerator designed for colliding two beams of protons at 7 TeV energy. The LHC is housed in a 27 km circumference tunnel, about 100 m underground. 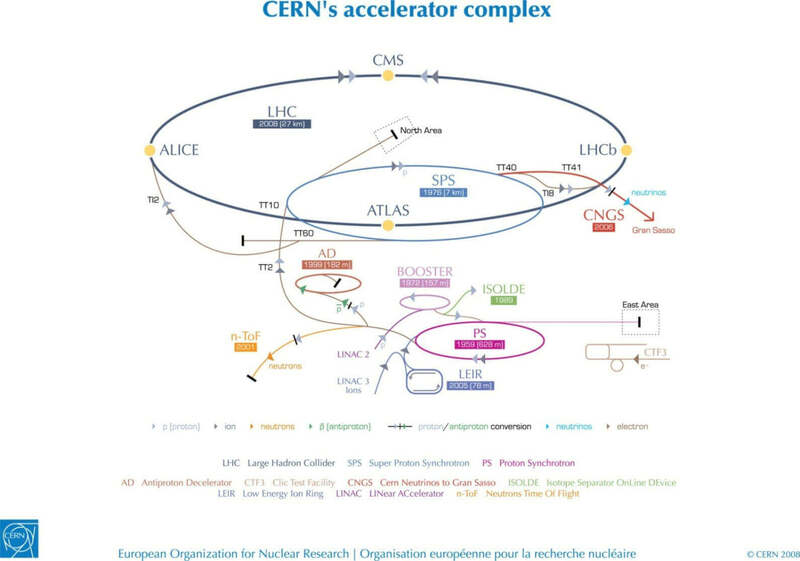 In order to improve LHC performance, CERN has launched a long-term program for the progressive replacement or upgrade of the old chain of accelerators presently used as injectors for the LHC. The Linac4 project is the first element of this program. Linac4 is a linear accelerator for negative Hydrogen ions (H-), which will replace the old Linac2 as linear injector for the CERN accelerators. Its higher energy of 160 MeV will give increased beam intensity in the downstream machines. Linac4 is about 100 m long, normal conducting, and is housed in a tunnel about 12 m below ground on the CERN Meyrin site. A surface building houses the Linac4 equipment. The Linac4 tunnel is connected to the existing chain of accelerators and can be extended to the new injection chain. CERN has recently built the Large Hadron Collider (LHC), a superconducting circular particle accelerator designed for colliding two beams of protons at 7 TeV energy. The LHC is housed in a 27 km circumference tunnel, about 100m underground. It is actively used for physics since 2010. In order to improve the performance of the LHC, and in particular the rate of collisions observed in the detectors (“luminosity”), the accelerator complex supplying the LHC with particles must also be improved. Two linear accelerators (Linac3 and Linac4) and four synchrotrons (LEIR, PSB, PS and SPS) are concerned. It is the purpose of the LHC Injectors Upgrade (LIU) project to implement in these accelerators the modifications and upgrades required for the LHC to reach its enhanced luminosity goal. ELENA (Extra Low Energy Antiprotons) is a 30-m circumference ring for cooling and further deceleration of 5.3 MeV antiprotons delivered by the CERN Antiproton Decelerator (AD) down to 100 keV, where the physics programme consists of trapping antiprotons to create antihydrogen atoms after recombination with positrons. The ultimate physics goal is to perform spectroscopy on these antiatoms at rest and to investigate the effect of the gravitational force on matter and antimatter. With the current set-up, most (99.9 %) of the antiprotons produced are lost due to the deceleration process. By using a ring equipped with beam cooling, an important increase in phase-space density and a high experiment injection efficiency can be obtained, resulting in an increased number of trapped antiprotons. With the construction of the ELENA ring, the AD experiments expect improvements of up to two orders of magnitude. In addition, ELENA will be able to deliver beams almost simultaneously to up to four experiments resulting in an essential gain in total beam time for each experiment. This also opens up the possibility of accommodating an extra experimental zone. The Proton Synchrotron (PS) is a key component in CERN’s accelerator complex, where it usually accelerates either protons delivered by the PS Booster or heavy ions from the Low Energy Ion Ring (LEIR). In the course of its history it has juggled many different kinds of particles, feeding them directly to experiments or to more powerful accelerators. The Super Proton Synchrotron (SPS) is the second-largest machine in CERN’s accelerator complex. Measuring nearly 7 kilometres in circumference, it takes particles from the Proton Synchrotron and accelerates them to provide beams for the Large Hadron Collider, the NA61/SHINE and NA62 experiments, the COMPASS experiment and the CNGS project. The SPS became the workhorse of CERN’s particle physics programme when it switched on in 1976. Research using SPS beams has probed the inner structure of protons, investigated nature’s preference for matter over antimatter, looked for matter as it might have been in the first instants of the universe and searched for exotic forms of matter. A major highlight came in 1983 with the Nobel-prize-winning discovery of W and Z particles, with the SPS running as a proton-antiproton collider. The On-Line Isotope Mass Separator ISOLDE is a facility dedicated to the production of a large variety of radioactive ion beams for a great number of different experiments, e.g. in the field of nuclear and atomic physics, solid-state physics, life sciences and material science. At ISOLDE, radioactive nuclides are produced in thick high-temperature targets via spallation, fission or fragmentation reactions. The targets are placed in the external proton beam of the PS Booster, which has an energy of 1.4 GeV and an intensity of about 2 �A. ISOLDE involves more than 500 scientists from 26 countries and 100 institutions. The High Intensity and Energy (HIE) ISOLDE project is a major upgrade of the ISOLDE and REX-ISOLDE facilities at CERN. The Radioactive ion beam EXperiment (REX) at ISOLDE has provided the nuclear physics community with a wide range of post-accelerated radioactive ion beams (RIBs) since 2001 and can currently deliver beams with energies up to 2.8 MeV/u using a normal conducting linear accelerator. The aim of the HIE-ISOLDE project is to greatly expand the physics programme compared to that of REX-ISOLDE. The most significant improvement will come from replacing most of the existing REX accelerating structure with a superconducting linear accelerator composed ultimately of four high energy and two low energy cryo-modules installed in series, and containing superconducting RF quarter-wave resonators and solenoids. Together they will allow a maximum energy of 10 MeV/u to be attained with full energy variability of the RIBs. This would allow all ISOLDE beams to be accelerated to energies well below and significantly above the Coulomb barrier, facilitating a broad programme of nuclear structure and nuclear astrophysics studies using different classes of nuclear reactions. 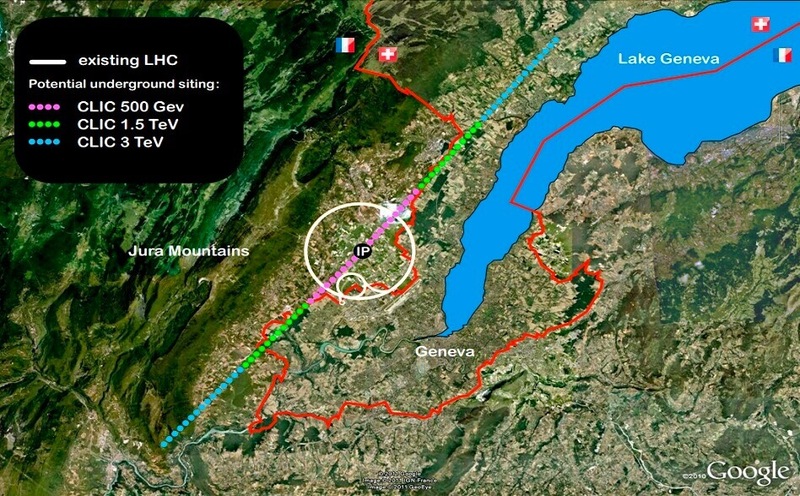 The Compact Linear Collider (CLIC) is an international study for a future high-gradient, multi TeV electron-positron linear collider, a machine which would complement the LHC at the energy frontier. CLIC relies upon a novel two-beam acceleration concept where pulses of 12 GHz RF power are generated by high-current electron drive beams running parallel to the main beams. The drive beams are decelerated in power extraction structures and the extracted RF power is transferred to room-temperature structures accelerating the main electron and positron beams. Thanks to its modular structure, CLIC would be built in stages of increasing beam energy. Many key aspects of the CLIC scheme are experimentally addressed in the CTF3 test facility operating at CERN and other test facilities in collaborating institutes. In parallel, detector and physics studies for CLIC are taking place, including specific technical developments and test-beam measurements. The CLIC study, hosted by CERN, is organized as an international collaboration with 46 participating institutes from 24 countries. It published the CLIC Conceptual Design Report in 2012 and is now engaged in project preparation. High Luminosity LHC (HL-LHC) is a project aiming to upgrade the LHC collider after 2020-2025 in order to maintain scientific progress and exploit its full capacity. By increasing its peak luminosity by a factor five over nominal value it will be able to reach a higher level of integrated luminosity, nearly ten times the initial LHC design target. To this aim, HL-LHC is exploring new beam configurations and new advanced technologies in the domain of superconductivity, cryogenics, rad-hard materials, electronics and remote handling. The HiLumi LHC study concerns new high and medium field superconducting magnets, superconducting radio frequency crab cavities, collimators and long powerful superconducting links. It is complemented by studies for new 1.9 K cryogenic plants, instrumented absorbers for high radiation flux and new beam diagnostics. The project started in 2011 as the European Commission FP7 Design Study “HiLumi LHC”. It is coordinated by CERN and includes some 20 institutes of the EU research area, Russia, Japan and the USA. S. Meroli, The management of large cabling campaigns during the Long Shutdown 1 of LHC , (2014).